Do you want a college football playoff? Do you love the tradition of a New Year's Day packed with A-list bowls? You can have both, with Stick Jockey's video game simulation of a 16-team tournament - and 27 bowls. Note: This is a very long column. There are more than 40 games described below. I've highlighted the playoff results in yellow if that's what you're really interested in. One of the most false debating points in the college football playoff argument is the idea that somehow the bowls diminish a playoff, or vice versa. I maintain that the bowl postseason should be preserved, running alongside a meritorious, 16-team playoff inviting the champion of every conference. The bowls - the better ones, anyway - have a majesty that far surpasses any "football NIT" label some think they'd acquire if the NCAA implemented a Division I football playoff. My idea is that, while a game like the Orange Bowl may not prefer a pairing of conference runner-ups, provided the sides are appropriately matched the games can be no less memorable. The bowls relentlessly tout their tradition, but forget that tradition, until the early 1990s, felt no obligation to help determine a national champion. And for a sporting culture so built on haves and have-nots, a holiday-based bowl structure as a consolation prize offers a much more meaningful postseason "reward," as one of the talking points always describes the bowls, to teams that rarely, or have never visited fabled venues like the Sugar or the Cotton, rather than sending them to Orlando to play in an advertisement for Champs Sports. The bowls have a great value. But they have no place in determining a national champion. The Bowl Championship Series is the most meritless selection of a champion in major sports in the entire world. Worse than boxing. Worse than international soccer's reputation for draw-rigging and other shenanigans. The Bowl Championship Series is a system that is built on backroom dishonesty, not one exploited by it. And it's almost proud to announce it up front. 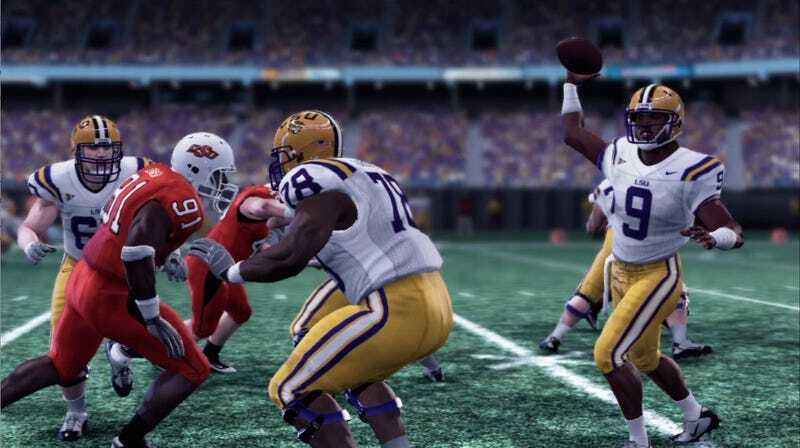 Well, not in the reality I control, which is NCAA Football 11. This week I set up a 16-team playoff, and then painstakingly redrew the bowls as close to their existing conference ties as the pool of eligible teams would allow. And yes, in this playoff, every Division I conference's champion is invited, even 6-6 Florida International. That is most consistent with the spirit of amateur competition, not sorting out some field based on reputation. With that in mind, after the conclusion of last Saturday's games, my seeding committee met and returned this field of 16. That follows exactly the final BCS rankings - including the revision that accounted for a marginal schedule-strength adjustment in LSU's calculation, which dropped the Tigers to 11th behind No. 10 Boise State. Tough. Boise State began the season ranked No. 5; apparently the incumbent advantage of a preseason top 10 doesn't apply to the Broncos, though it absolutely would for any one-loss team from the BCS' automatic-qualifier conferences, especially the SEC. Boise State also won five games by 40 or more points. Meantime, LSU nearly choked away a win to a decapitated North Carolina, prevailed at Tennessee only because the Vols' defense can't count, and barely escaped against a 7-5 Florida. And, ultimately, I'm calling the shots here. So Boise's in. As for the rest of the backstory, these bowl pairings form a continuity with last year's. That is, the bowls that died for lack of eligible teams in the 2009-10 simulation didn't return this year. The same scheduling agreements also are in place: The NCAA Playoff leaves New Year's Eve and New Year's Day for the bowls, but all bowls must be played by the Jan. 6 national championship game. Bowls' conference tie-ins were preserved but, in reverting them to true postseason exhibitions, all were allowed to send invitations regardless of conference finish. Final note: Last year I simulated these games by playing the computer against itself in an exhibition of seven-minute quarters. That produced a lot of artificially dramatic endings. This year, all games were simulated offline within NCAA Football 11's Dynasty Mode. I set the participants into custom schedules where they faced each other in the first game of the year. This returned more accurate statistical totals and scoring summaries, though it prevented me from seeing key plays and other narrative details of the games themselves. I do not claim that this is a scientific simulation. These games were played once. Andy Dalton completes 17 of 20 passes, two for touchdowns, as TCU carries a 17-7 lead late into the third quarter. From there it all comes apart. Dalton is knocked out of the game, bringing in freshman Casey Pachall. Connecticut closes out the third quarter with a 66-yard touchdown drive, drawing to 17-14. Following a TCU field goal Cody Endres hits tight end Ryan Griffin, who sheds one tackler, finds a seam, and races 70 yards for an astonishing 20-19 lead with 6:06 to go. Pachall is sacked three times and tosses two interceptions in the final five minutes, the last one on third-and-six from the Connecticut 24. The day has just begun and we already have the first goliath upset of the 2010-11 NCAA playoffs. No such drama here as the top-seeded Tigers reel off a 41-0 lead through the third quarter and cruise 41-7. Cam Newton has a poor day, going just 17-of-33 for 176 yards and a touchdown. Auburn halfback Michael Dyer more than picks up the slack, though, with 190 yards rushing and three touchdowns. A seesaw shootout through three quarters has the Buckeyes in control, 31-26. Then Ohio State steps on the gas, torching the Hokie defense for 17 unanswered fourth-quarter points, abetted by two VPI turnovers. Terrelle Pryor throws for 300 yards and four touchdowns, while Tyrod Taylor is 17-of-28 for 224 yards with a touchdown and an interception. Buckeye receiver DeVier. Posey has an eight catch, 110-yard day as Ohio State advances, 48-32. In the first night's feature contest, Michigan State leads 14-7 at the half, then rips off a 21-point third quarter and never looks back. Two cosmetic touchdowns from the Hogs make it a 35-21 final. Spartans quarterback Kirk Cousins throws for 293 yards and two touchdowns while the Michigan State defense sack Ryan Mallett three times and shut him out of the end zone except in garbage time. It's never close as the Badgers win 37-10 and keep the Wolf Pack out of the end zone for the entire second half. Curiously, Wisconsin's brutal rushing game is kept in the barn as quarterback Scott Tolzien throws for a season high 297 yards and four touchdowns. Wisconsin's defense smothers the Nevada pistol offense, registering five sacks and 17 tackles in the backfield overall. Though Oregon is never in trouble, the 24-10 final raises eyebrows as it is just the second time all year the Ducks have been held under 30 points. Oregon is a pitiful 3-of-14 on third down in a sloppy game for both sides (Miami turns the ball over three times). But Oregon never punts, and Darron Thomas tosses two touchdowns, running for a third to salt away the win. The Cardinal breeze by UCF 25-6 behind 335 yards passing from quarterback Andrew Luck, 13 of those passes going to wideout Ryan Whalen for 211 yards. The Cardinal sack Golden Knights quarterback Jeff Godfrey five times in a game never as close as the score suggests. Squeaking in with the last at-large bid, the Broncos make the most of their opportunity in this rematch of the dazzling 2007 Fiesta Bowl. Boise State intercepts Sooner quarterback Landry Jones five times, though the score is much closer than that would indicate. The Sooners battle back to trail just 21-17 after the third quarter, but another costly interception and an 82-yard touchdown drive kill Oklahoma's will in the fourth quarter. The Broncos prevail 28-17 on defense, not offense, holding the Sooners scoreless on three of four red-zone trips. In real life this is UTEP and BYU. In our simulation, Syracuse ended up here when Pitt bumped it from the Pinstripe Bowl. That sent BYU to a better option, the Humanitarian. The Orange win in a romp, 41-16, with Delone Carter piling up 196 yards and four touchdowns rushing. Syracuse's defense holds the Miners to just 1-of-15 on third down; UTEP quarterback Trevor Vittatoe completes just six of 33 passes. The Humanitarian gets a much better draw with the Cougars going six hours north for their last bowl game as a Mountain West representative. BYU quarterback Jake Heaps is sacked five times but still rolls up 330 yards and two touchdowns through the air. Sending Ohio to New Orleans gives its fan base a better bowl trip while making room for a deserving Temple elsewhere. A seesaw battle ends 25-22 when Ohio, out of timeouts, can't get its field goal unit on in time. Troy's Michael Taylor kicked a 47-yarder with 2:32 left for the final score. The Golden Eagles are headed here in real life; South Florida was chosen here instead of Syracuse for the obvious hometown ties. The Bulls win a ghastly snorefest 17-3, though USF receiver Dontavia Bogan does have a nice day with 136 yards and a touchdown. Utah moved up when TCU got a playoff bid, making Air Force the attractive pick in a Mountain West city it already visits. Northern Illinois is subbing for the Pac-10, which after Stanford and Oregon went to the postseason, was left with only Arizona and Washington as bowl eligibles. The Falcons win a tense duel with 10 fourth quarter points, the decisive score coming on Jordan Waiwaiole's pick-six of Huskies quarterback Chandler Harnish with 6:39 left. Asher Clark has 162 all-purpose yards and a touchdown reception. The clock hits an early midnight for Cinderella Connecticut. Terrelle Pryor tosses three touchdowns, two to tight end Jake Stoneburner. Running back Daniel Herron adds 118 yards as the Buckeyes lead 33-14 at the half and smoke Connecticut 40-29. The Spartans grab a 10-point lead in the first quarter, but upset talk is premature as the Tigers spool out 24 unanswered points by halftime. Kirk Cousins has another superb day, going 29-of-38 for 336 yards and two touchdowns. But Cam Newton returns to form with coldly efficient 22-of-30 passing for three touchdowns, adding another 34 yards on the ground. Only two Auburn fumbles prevent this decisive 34-22 victory from turning into a romp for the Tigers. This rematch of a lively 2008-2009 miniseries between the two sides sees Boise State clinging to a 19-17 lead opening the fourth quarter. The Broncos add a 53-yard field goal from Kyle Brotzman to push the lead to 22-19, but Oregon mounts two backbreaking drives, one capped by a LaMichael James 4-yard plunge with 7:26 to go and the last a weaving 12-yard run by Darron Thomas with 3:39 on the clock. Oregon survives the scare and advances 30-22. The Badgers and Cardinal dance the feature in this rematch of the 2000 Rose Bowl. Tied at 10 at the half, Wisconsin picks up five field goals from Philip Welch, including a 48-yarder to open a decisive fourth quarter, and puts Stanford away when Jay Valai picks off Andrew Luck and returns the interception 22 yards for a touchdown with 6:13 remaining in the game. Luck has another 300-yard passing day but throws two costly interceptions as the Badgers prevail 42-20. Ordinarily the Mids would go to the Military Bowl in nearby Washington, but that one picked Army instead to avoid rematching the Black Knights with Hawaii. Hawaii wins this one 27-22 with 13 points in the fourth quarter. Navy gets 217 yards rushing but needs 60 attempts to do so. Hawaii's Bryant Moniz meantime goes 35-of-47 with 369 yards and two touchdowns, adding another 35 yards and a touchdown rushing. Georgia Tech is in this one in real life, too, but the Aztecs take the place of Air Force. It's a blowout for the Yellow Jackets, 45-17. Tevin Washington plays most of the second half, subbing for a still-gimpy Joshua Nesbitt, tossing two touchdowns. Anthony Allen rumbles for 109 yards and three touchdowns. Louisville has a history of playing in these off-brand flyover bowl games; the GoDaddy committee happily traded up for the Cardinals (from 6-6 Sun Belt tomato can Middle Tennessee in real life), pairing them off with Temple, who at 8-4 has no bowl bid in real life. Temple's Bernard Pierce gains 125 yards rushing and a touchdown but the Owls lose a somnambulant game, 17-7, which features no scoring for the final 28 minutes of regulation. West Virginia's here in real life. Miami gets this bid when State moves up to the Chick-Fil-A-Bowl. Bringing the ‘Canes up for a rematch with its old Big East foe makes plenty of sense to the Champs Sports folks, and they see a gun show. The Mountaineers go up 21-0, but touchdown passes of 66, 56, and 33 yards from Jacory Harris to Leonard Hankerson bring Miami to 24-21 midway through the third quarter. But a relentless West Virginia defense led by J.T. Thomas (four tackles for loss, two sacks) helps put the game away by a 27-21 final. Boston College has terrible fan support - they don't even show up for home games - which is why the Eagles often end up in backwaters like the Kraft Bowl. Like real life, a dearth of Pac-10 eligibles is why BC comes west; they face Fresno State subbing for playoff-bound Nevada. The Eagles win 23-16 behind 268 yards passing and three touchdowns from Chase Rettig and 128 yards rushing from Montel Harris. To be honest, I have no idea what circumstances led me to place either of these teams here, other than the Big 12 ran out of eligibles and Tulsa was a respectable 9-3. Tulsa gets a 97-yard kickoff return touchdown from Damaris Johnson at the end of the first half and goes on top 17-16 when Charles Clay finds G.J. Kinne on the halfback pass for a five yard touchdown very early in the fourth quarter. Northwestern prevails 19-17, however, on a field goal with 2:32 left and a fumble recovery on Tulsa's final drive. Quick, name the last bowl victory for Army. Somewhat surprisingly, the Military Academy has been to just four in its history, last taking home hardware at the 1985 Peach Bowl. That changes after Army's Patrick Mealy gallops 84 yards for the decisive score with 2:55 in a wild 31-27 victory in the nation's capital. Army quarterback Trent Steelman is the game's MVP with 105 yards rushing and 206 yards passing, accounting for three of the Black Knights' touchdowns. Clemson buries Kentucky 41-10 with 461 yards of offense to the Wildcats' 155. Not much to talk about here as Kyle Parker throws for 294 yards and three touchdowns. On defense, Da'Quan Bowers records a whopping four sacks, one of them forcing a fumble. The Alamo normally gets the second pick of the Pac-10's eligibles. In this alternate reality, the dearth of eligibles from that conference, plus a sweeter offer from the Holiday Bowl to Washington, meant the ACC had to fill in with Maryland. Baylor delivers an old-school Southwest Conference gunfight as the Bears' Robert Griffin unloads 484 yards passing and five touchdowns on Maryland's hapless secondary. Baylor rolls 40-24 in front of a delighted home crowd. Auburn's Cam Newton turns in another performance for the ages, throwing six touchdown passes on top of 354 yards passing and another 62 running. Wisconsin is helpless to stop the Auburn quarterback as the Tigers lead 42-18 after the third quarter and rest their starters in the fourth for the national championship game in Houston in 10 days. The final is 42-32. What has the makings of a shootout in the first half bogs down in the mud in the second, as Ohio State shuts Oregon out of the end zone, forcing the Ducks to settle for two chip-shot field goals that draw the score to 21-20, Buckeyes. Ohio State stiffarms Oregon with two 40-plus yard field goals by Devin Barclay in a tense final four minutes, the last one a 47-yarder into the wind with 0:57 remaining. Oregon's offense, choked by the Buckeye secondary all game, manages nothing on a desperate final drive. Ohio State wins 27-20, and advances to its third national title game in the past five years. The Buckeyes' Dane Sanzenbacher has an eight-catch day for 169 yards and two touchdowns. I suppose I could have sent the Tar Heels to the Champs Sports Bowl and preserved the real life Miami-Notre Dame matchup here. For some reason, this seemed like a better idea. Besides, North Carolina gets a New Year's Eve bowl and has an easier time against Notre Dame than it would against West Virginia. The Heels win 31-13 in what is the second-oldest (in a tie) bowl game in the U.S. I did not know that. Typically this pairs Conference USA's champion with the SEC's last qualifier. But a handshake agreement with the Chick-Fil-A put the Vols in Memphis (and Georgia in Atlanta). A slow-boil of a game sees 28 points bubble over in the fourth quarter. The Vols' Denarius Moore hauls in his second touchdown (on a 119-yard receiving day) to break a 20-20 tie and give Tennessee the 27-20 win. SMU should have prevailed, were it not for four turnovers. The only new bowl my NCAA certified in this continuity. I thought hard about sending Syracuse to the Big Apple, as they will do so in real life, but in the entanglements of this alternate reality, that meant Pittsburgh would have ended up in New Mexico, or worse. As disappointing as their season was, they didn't deserve that. Here the Wannstache-less Panthers triumph in a 44-37 shootout behind 391 yards and three touchdown passes from Tino Sunseri. N.C. State is always welcome in Atlanta, having appeared in the old Peach Bowl seven times, but none since 1995. The Wolfpack faces a 6-6 Georgia team happy to have a home crowd and fat payday. State quarterback Russell Wilson throws for two touchdowns but the star of this game is kicker Josh Czajkowski, who hits four of five attempts and bangs through a 54-yarder with 3:23 left to euthanize the Dawgs, 27-21. The weakest pairing of the second-tier bowls, the Holiday at least gets a Pac-10 school, albeit 6-6 Washington. Kansas State has plenty of fans happy to fly to San Diego for the holidays and call that the biggest thing they've done all year. The Huskies' Jake Locker throws for 328 yards and four touchdowns in an easy 48-24 victory. The loss of three Big Ten teams to the playoff means a host of also-rans must represent the conference on New Year's Day. A clearly outclassed Illinois gets throttled by South Carolina 31-10. Marcus Lattimore is held to just 57 yards but quarterback Stephen Garcia's 254 yards passing and two touchdowns are more than enough. Even though Iowa defeated Penn State in a lackluster year for both, I sent the Hawkeyes here on the premise that the Rose committee would want one last opportunity to give Joe Paterno a gold watch. As it is, the only one retiring is Florida coach Urban Meyer, who bows out with a 39-17 defeat thanks to a five-touchdown day from Iowa quarterback Ricky Stanzi. What the hell happened to the Gator? This used to be a solid second-tier bowl (hell, it's the best one N.C. State has ever played in). Now it picks from the dregs of the SEC and the Big Ten. Mississippi State is actually a lot better than that billing, they just had the misfortune of playing in the SEC west (all four of their losses were to teams ahead of them in that division). Michigan still squeaks out a 30-23 win behind 288 yards passing and 46 yards rushing, plus a touchdown, from Denard Robinson. Vincent Smith adds 125 yards rushing and two touchdowns. Despite losing its last four games, Arizona finally gets its first Rose Bowl appearance, though it took probation for USC to deliver it. Robert Bolden throws for 302 yards and runs for another 48 for the Nittany Lions, but it's not enough as Arizona prevails 31-27 on a late fourth quarter pass from Nick Foles to Juron Criner. Big Red's Big 12 swan song concludes at the site of many a finale to Nebraska's seasons - the Orange Bowl, the old Big Eight prize. The Cornhuskers face Florida State in a matchup recalling the 1993 and 1994 contests, the last one for the Seminoles' first national title. Taylor Martinez is intercepted three times but Nebraska hangs on to win a defensive struggle 20-10. Mark Ingram's 22-yard touchdown run with 5:34 left delivers victory to Alabama, 24-21 in what is deemed the "Bear Bowl," as it matches two programs coached by one Paul Bryant. Greg McElroy is an efficient 19-31 for 268 yards and a touchdown, but Ingram's 147 yards rushing earn him the Cotton MVP. Unlike other SEC heavies who've gotten the Sugar as a parting gift in the past, LSU comes out to prove a point about being left off the NCAA playoff bracket. Patrick Peterson's 66-yard punt return caps a 21-point first quarter for the Bayou Bengals, who blow out Oklahoma State 41-6. LSU's defense turns aside five Cowboy trips to the red zone, surrendering just a field goal in one of them. Stevan Ridley has a colossal day, 7 receptions for 208 yards and three touchdowns - as a running back, which has to be a record. The Fiesta, the major bowl whose tradition is rooted in a post-New Year's kickoff, goes last with a typically eclectic matchup. A seesaw battle is tied at 17 at the half and 24 early in the fourth quarter, but the Utes prevail 27-24 with a clock-killing fourth quarter drive and 27-yard field goal with 1:09 left. Utah's Eddie Wide contributes 74 yards rushing and 105 yards receiving on four catches, with a touchdown in each department. Mizzou quarterback Blaine Gabbert tosses two touchdown passes, but also two very costly interceptions, both in the second half. Interestingly, these two schools split the 1957 National Championship, Auburn taking the AP poll, Ohio State earning the UPI/Coaches' nod. Billed as a showdown of quarterbacks Cam Newton and Terrelle Pryor, the second NCAA national championship game fulfills that promise and more. Pryor tosses for 292 yards and two touchdowns, Newton is 31-of-42 for 334 yards and three touchdowns - with two receivers having 100-yard days. Neither team has a rusher with more than 49 yards. The difference, naturally, is in special teams and turnovers. Auburn loses two fumbles, and the Buckeyes get an 88-yard punt return touchdown from Jordan Hall with 14:28 left in the fourth quarter to take a 31-17 lead, ultimately winning 34-24. Pryor is named the game and playoffs' MVP, and the Buckeyes, in their third try against an SEC foe, land their sixth national championship. For the second time in the NCAA Playoffs' first two years, the sixth seed wins the title.